I rolled outta bed… actually off the couch and then not long after, prepared myself for a walk in town with Mom. Mike and I have been sleeping on the couch in the basement for a few reasons. Mom and I peaked in at the house progress and then began our walk/jog. 7.5 sweaty kilometres later, we finished our efforts for the day and told the guys to be back home for lunch within half an hour. Tortilla pizzas were prepared via BBQ to keep the heat down in the house and the four of us enjoyed them, the guys heading back to finish the wiring once they were done. 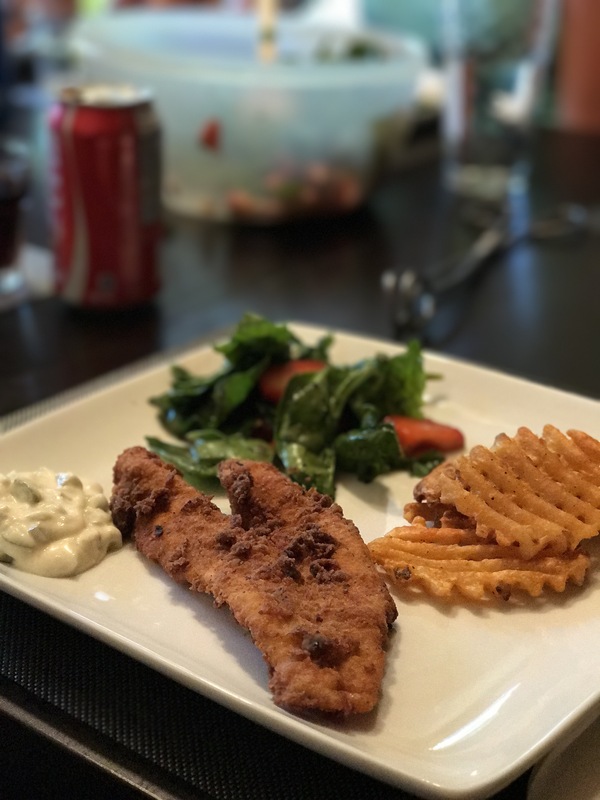 Fresh fried fish, fries, garden spinach salad wit caramelized nuts and strawberries and homemade tartar sauce for the fish dipping. I was peacefully sleeping when the phone ringing pulled me out from under the covers. I wouldn’t have gotten up to get it in normal circumstances but it was Moms number so I figured it was important. As I answered, Mom told me in a weary sounding voice to ‘come upstairs’. She was supposed to be in town so the fact that she didn’t sound herself and was telling me to come upstairs to see her was a tad concerning. Long story short, two vehicles were needed in town and she had been the driver of one, but that was no longer possible so I had to take her place and drive the truck into town. Once I arrived in town, the needed vehicles were swapped out and my sister-in-law gave me a ride back home. 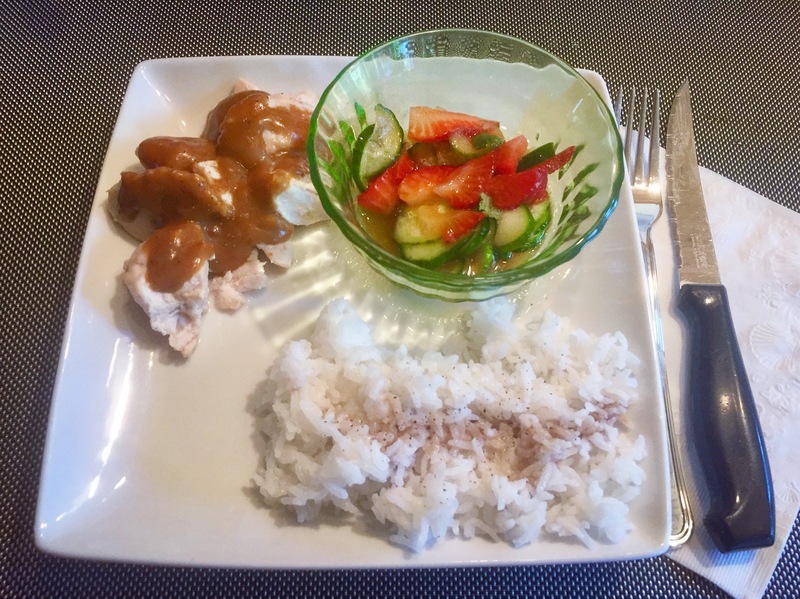 Where I made myself a virgin mojito and pretty much just sat out on the deck until it was time for me to make supper for Dad, Mike and I.
Grilled chicken and rice with peanut sauté sauce and a cucumber, strawberry and lemon juice salad. Made with agave syrup instead of sugar since a decision to try to be even only a smidgen healthier then I regularly am, had been made at the start of the week. Haha! 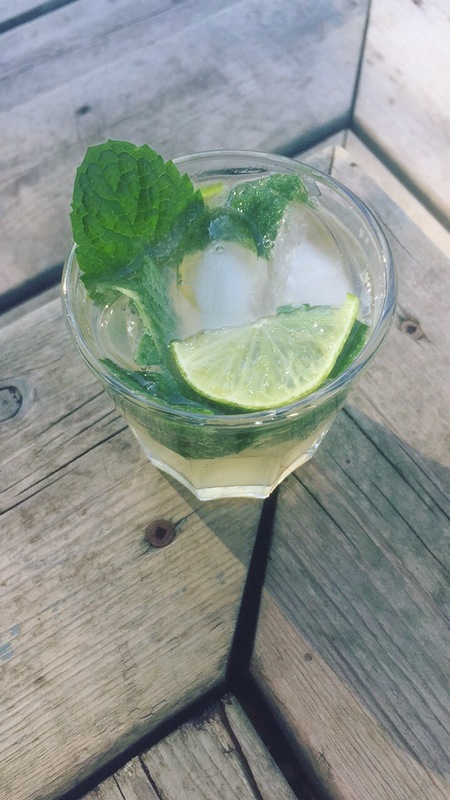 Can you make the virgin mojito into a recipe and post it!! It always looks great!